Moravek’s Sugar Dissolving Centre has been designed to enable batches of granulated sugar to be dissolved in water before being filtrated and cooled as the liquid sugar is transported into the place of use. 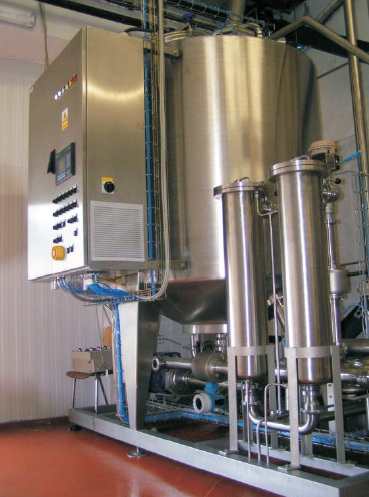 The centre is capable of producing liquid sugar not exceeding 75 Brix and the dissolving temperature can be set within the range of 80 to 95°C. The unit comprises two independent tanks; one for sugar dissolving and the second for hot liquor recovery. It also contains a valve cluster including flow distributing plate and heating cluster as well as circulation pipework belonging to the dissolving tank including mixing ejectors, cooling plate heat exchanger and filtration cluster. The centre is fitted onto a stainless steel base frame together with an electrical operating panel. Brix content in liquid sugar can be accurately measured and the centre includes automatic water dosing. The control of electronic steam pressure in double sheet avoids the possibility of the product caramelising. The unit uses intensive ejector agitating with re-circulation circuit flow control rather than propeller agitators. Automatic procedures including cooling and filtration occur during water preheat, dissolving and delivery. 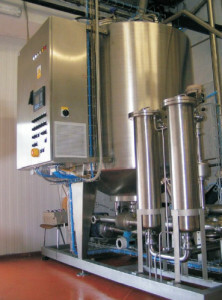 Automatic flow control is enabled during product delivery mode including the desired dose of the product. The centre includes two levels of automatic CIP procedures. Operator control is only necessary for the manipulation of granulated sugar, changeover of flowplate and initial choice of procedure on the control panel. The centres include easy to use Allen-Brandley PLC control systems with operator’s panel. Communication is enabled for up to three further pieces of equipment and a CIP unit. The centre is easy to maintain with a minimum number of moving parts.